For the second time in three years rail transit advocates scored a major political victory in November. This year’s victory came in the form of the 51.5% to 48.5% defeat of Issue 48 which would have banned all investments in rail transportation for the next decade. The defeat of Issue 48 coincided with the overhaul of Cincinnati’s city council. The new council includes a 7-2 majority in favor of the Cincinnati Streetcar (previously 4-4-1), and an 8-1 progressive voting block after four Republicans were not reelected. Also striking with new council is that the three brand new members are all Democrats and all 32-years-old or younger. Still, the news of the day was the repeated defeat of a measure intended on stopping Cincinnati from building a modern streetcar line and planning a comprehensive regional light rail system. Construction of the Midwest’s first modern streetcar system is now scheduled to commence in the coming months. 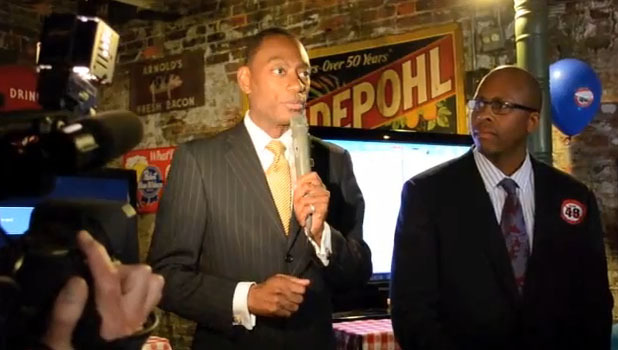 UrbanCincy will provide more in-depth updates on the 2011 election results in the coming days, but for now enjoy this exclusive footage from the Cincinnati Streetcar celebration at Arnold’s Bar & Grill last night.